I went home to LA for my mom’s birthday and as usual, my Bay Area culinary tendencies went straight out the window. Being raised on Southern Cooking is a hard, hard thing to walk away from. And why would you? There is a place in the world for kale slaw and a place in the world for vegetables cooked into oblivion with bacon and butter. I live with one leg in both of these places and plan to keep it that way. One of my favorite coming home stories involves the fact that every time I fly down, my mom’s mac and cheese is always sitting on the stove waiting for me that night. Without fail. One night I asked my mom why she always made this particular dish for me on my first night home, and she said, “Well, because you usually get in after dinner so I know you just want something light.” Mac and Cheese. Something light. Did I mention she’s from New Orleans? So it comes as no surprise that when our neighbors showed up with home-grown tomatoes, we found some unripe ones and decided to immediately fry them in fabulous ways. 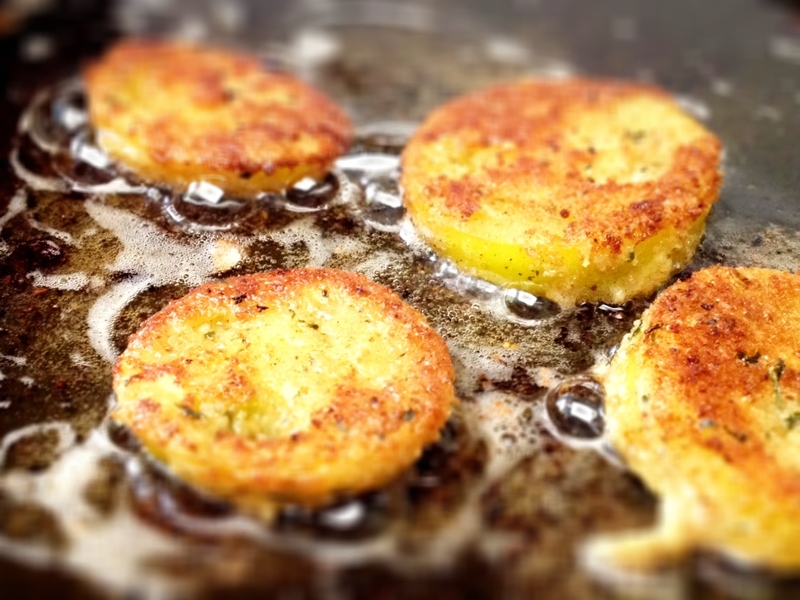 Fried Green Tomatoes. Coincidentally (or just completely not surprisingly) we had also been frying up some bacon, so we decided to fry the tomatoes in…wait for it… BACON GREASE. Yeah, I did. These beautiful green babies are great on their own, or as the star of the best BLT you’ve ever had in your life. 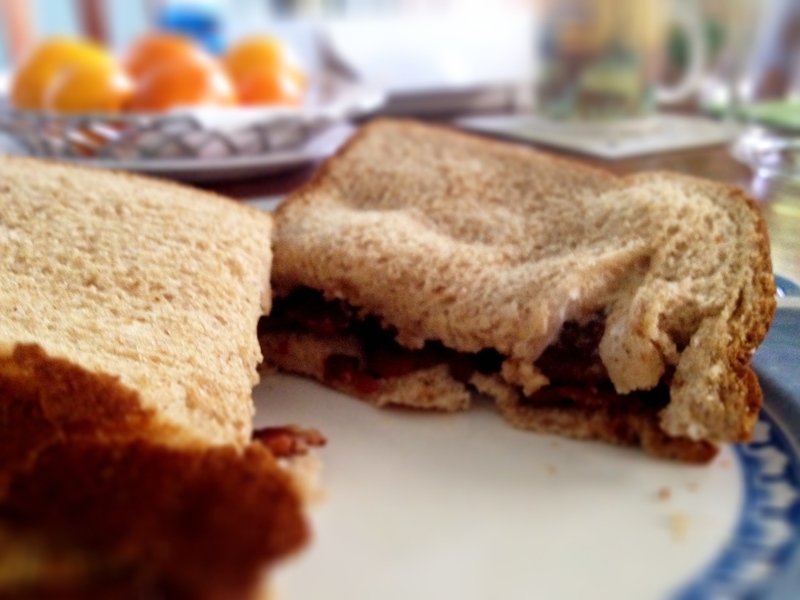 Best served with a glass of home-made sweet iced tea. Add salt, pepper, and seasonings to taste to your breadcrumb bowl and mix, lining up next to your flour and egg bowls. 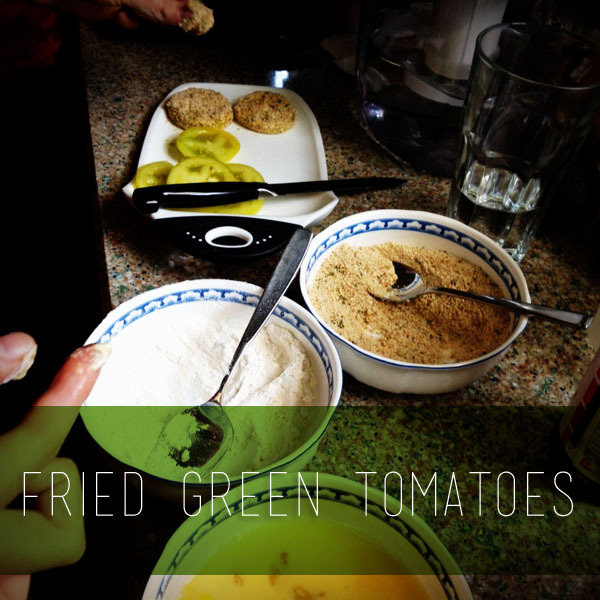 Dredge tomatoes lightly in your flour bowl, and then dip in the beaten egg until coated. Transfer to your breadcrumb mixture until thoroughly battered, and shake off excess crumbs. Tip: Dip into the dry ingredients with one hand and the wet ingredients with the other – this keeps things a lot less messy! Heat oil in a pan until nice and hot. Place tomatoes in pan until browned on one side, 2-3 minutes. Flip until the other side is also a delicious golden brown, and transfer onto a plate lined with paper towels or a paper bag.